June 29, 2016, 9:30 a.m.
By Shan Wang @shansquared June 29, 2016, 9:30 a.m.
New projects are brewing over at First Look Media. The Pierre Omidyar founded (and funded) organization once intended to launch a slate of topical digital magazines, following the blueprint of The Intercept, but has pivoted far, far away from that original plan. For an unfortunate period, it was making headlines, but mostly about itself. It’s now emerged as a full-fledged digital media company and studio, within which The Intercept lives on, alongside other publications like social-first reporting network Reported.ly and comics site The Nib (currently hosted on Medium, but relaunching this July) and initiatives like the Press Freedom Litigation Fund. 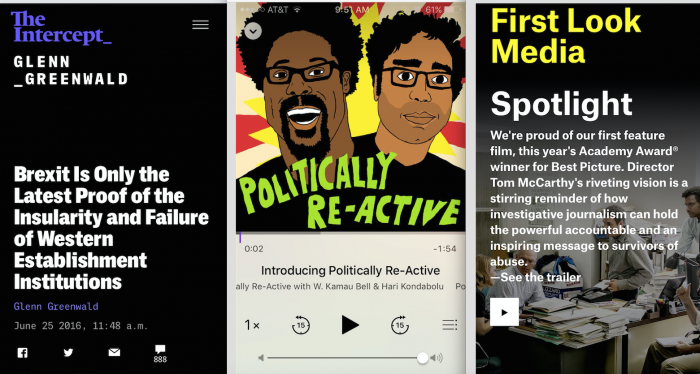 This newer iteration of the company co-produced and helped fund the film Spotlight, and most recently launched a podcast with Slate’s Panoply network called Politically Re-Active, hosted by comedians W. Kamau Bell and Hari Kondabolu. Now another big new platform (and brand) is in the works, though details are still scarce. First Look Media announced back in March that it was hiring Anna Holmes — previously editorial director of Fusion and the founding editor of Jezebel — in a “senior editorial role” to build a new media property, launching this fall. Holmes told Politico on the news of her hire that the platform will be about “developing, surfacing, creating and amplifying creative storytelling in predominantly visual media with a focus on independent voices.” Holmes declined to comment for this story, citing the fact that the platform is still a work in progress. The Editor will assist in spearheading the creative development and managerial/logistical oversight of original and curated editorial storytelling content on both FLM-native and social media platforms. This editorial slate will include formats like video series, one-off films, podcasts, photo essays, graphic narratives and storytelling in other formats and technologies like VR and live-streaming. The VP of acquisitions for the new platform, according to the job listing, will seek out programming both audio and visual, working with the larger First Look Media programming team, helmed by TV veteran Adam Pincus (to whom Holmes reports). Will we be seeing a swell of 30 for 30-type films from First Look Media? The VP of Acquisitions will identify existing and work-in-progress programming, including short films (both documentary and narrative), short-form video series and other “made for digital” short-form video, feature films (both documentary and narrative), and potentially, television series and specials, including those with the potential to be repurposed into short-form programming for digital distribution. The VP of Acquisitions will also look for and identify audio programming for potential acquisition, including radio and podcasts. Working in partnership with FLM Business Affairs, the VP of Acquisitions will be responsible for deal-making related to the acquisition and/or licensing of stories that align with our brand. The ideal candidate will have extensive experience in the film/television/radio/podcast marketplace and strong relationships with festival and theater programmers, executives, producers and creative talent. The position will require travel to film festivals, conferences, and other content marketplaces; the screening of submissions; outreach to talent; and deal-making related to content acquisition/licensing. You can view a full list of openings at First Look Media (and apply for them!) here. POSTED June 29, 2016, 9:30 a.m.
Wang, Shan. "First Look Media is building a new platform that aims to include everything from films to podcasts." Nieman Journalism Lab. 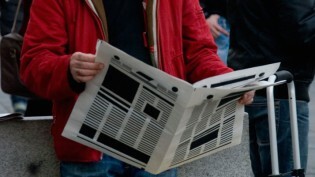 Nieman Foundation for Journalism at Harvard, 29 Jun. 2016. Web. 20 Apr. 2019. Wang, Shan. "First Look Media is building a new platform that aims to include everything from films to podcasts." Nieman Journalism Lab. Last modified June 29, 2016. Accessed April 20, 2019. https://www.niemanlab.org/2016/06/first-look-media-is-building-a-new-platform-that-aims-to-include-everything-from-films-to-podcasts/.